The star is fraught with symbolism. It has deep meaning that encompasses self, the world and the whole universe. The shape of the star gives it special meaning. The number of points it has, whether or not it has thorns and if other symbols are used to form the star are different aspects that can give a star mandala design a more specific meaning. Stars symbolize independence due to their self-sustaining nature. They are literally balls of gasses and dust that hold themselves together. Stars also symbolize solitude, as they lead a solitary existence. Stars in a mandala can signify an independent nature, confidence and the strength to stand alone. We are, in fact, more like the stars than you may think. Our bodies are actually made of the same minerals and gasses that stars are made of. Mankind has always looked to the stars for guidance. Due to this, stars symbolize navigation, intuition, radiance and light. We look to the stars to literally light the way at night and to light the way, or give us guidance, in our life path. Energy, dreams and gravity are a part of star symbolism. They give us guidance in our dreams, energy to follow our dreams and gravity to keep us firmly grounded. A star can also be a good luck symbol or “lucky star.” It represents luck because long ago people believed that the stars determined whether or not a person would be blessed with good fortune. It represents the union of fire (the upright triangle) and water (the inverted triangle). It can be used to symbolize gold. Alchemists once believed the mixture of these two elements, fire and water, could turn any metal into gold. It represents the union of spirit and matter or body and soul. This type of star is also known as the Star of David which, of course, has deeper religious symbolism. This six-pointed star is the symbol for the Heart Chakra. Star mandala patterns make lovely jewelry. The star mandala design is especially well-suited to pendants, necklaces and dangly earrings but they can be found in other types of jewelry like rings and brooches. They are made from a variety of materials and in many different colors. The colors can bring additional meaning to the jewelry, too. A green or pink six-pointed star pendant would be an excellent symbol for the Heart Chakra. This type of jewelry made with green or pink natural gemstones will activate your Heart Chakra, helping you out in the area of love. Etsy has a nice selection of star mandala jewelry. Star mandala art is available in nearly any form, including wall hangings, prints and sculptures. The star mandala designs can be made from nearly any media from paint to natural fibers and even glass. 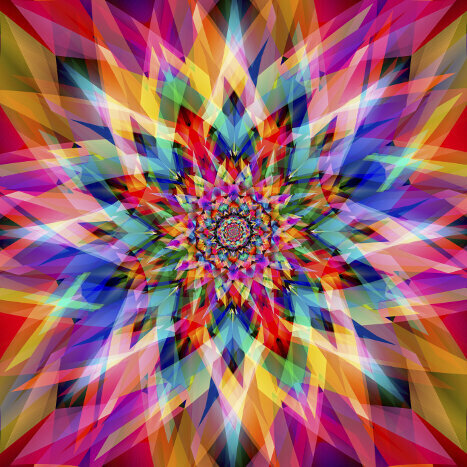 As with jewelry, various colors used in the star mandala patterns can be used to give it the piece specific meaning or just to fit it with your décor and personal taste. Etsy also has a great selection of star mandala art. You can create your own star mandala design with a compass and pencil. It is a fairly simple shape to draw within a circle. Use any media that you are comfortable with or push the boundaries a bit with coloring media that you are not familiar with. Try using paint, either water color or oil. You may surprise yourself. Colored pencils work best if your star mandala design has intricate patterns that require a fine tip. Pastels are wonderful if you want to go with a soft color palette. Charcoal pencils are excellent for star mandalas colored in shades of grey. You may be surprised by how expressive and satisfying shades of grey and black can be. Coloring pages can be downloaded online for free and printed out if you prefer. Coloring Castle has some nice star mandala coloring pages. 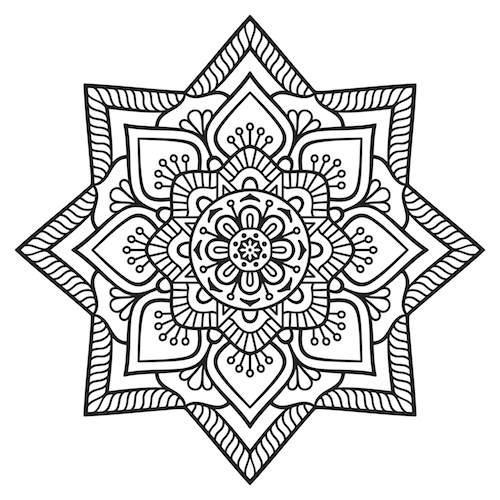 What’s Your Sign has a nice star mandala coloring page, too. You can buy an entire star mandala coloring book for $5 to $15 on Amazon. Star mandala tattoos can be as simple as a star within a circle or as intricate as a star within a lotus flower in a circle. They can be colorful or just grey and black. Star mandala tattoos should be placed so that the whole thing can be seen at a glance. These tattoos look best on a large, flat area like the back or chest. Smaller, scaled down mandala tattoos look nice on smaller areas like arms and legs.